Restylane® is an injectable dermal filler, used to restore more youthful features by re-plumping the lips and deep creases. Restylane is a biodegradable gel, the only injectable dermal filler that contains NASHA (Non-Animal, Stabilized Hyaluronic Acid). That means there is no chance of allergic reaction. Millions of patients in more than 60 countries have benefited from Restylane treatments. You do not need a pre-treatment skin test before receiving Restylane treatments. It can be used safely in combination with several other cosmetic procedures including Botox®, dermabrasion, and chemical peels. 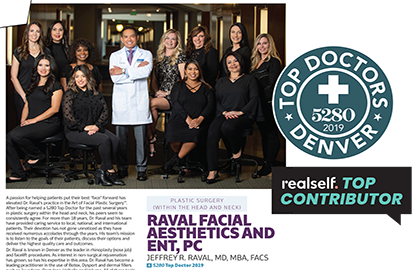 To avoid any discomfort during your procedure, Dr. Raval may apply a topical anesthetic cream first or, in some cases, he may recommend a local anesthetic injection. Immediately following treatment, most patients experience some slight swelling, tenderness, redness, or an itching sensation in the treated area. Tiny amounts of Restylane are injected into the skin using a very fine needle. Results are immediate and long-lasting, providing natural-looking enhancement that is gentle and safe for your skin. Over time, the gel turns into water and carbon dioxide and is absorbed into your body. This is actually one of the great advantages of Restylane — it is long lasting, but not permanent. That makes it an ideal complement to your constantly changing face. You will continue to age, but you can choose to continue receiving refresher injections in order to maintain the natural look you desire. Restylane is an injectable gel that restores a more youthful appearance by replenishing lost volume. Your skin will look smoother, and your overall appearance will be revitalized. The gel is produced biotechnologically using stabilized, non-animal hyaluronic acid and water. Hyaluronic acid is a substance naturally produced by the human body. Restylane® Lyft is a related dermal filler specifically developed to add volume in the cheeks. It is the only FDA-approved injectable for this purpose. Restylane is manufactured by Q-Med AB, a Swedish biotechnology/medical device company that has offices throughout the world. The company’s products are supported by ongoing research, always with safety as a top priority. After millions of treatments over more than 20 years, Restylane has been proven to be safe, effective, and long lasting. Restylane enhances your natural facial features by instantly softening visible signs of aging, especially in your cheeks and lips. The gel replenishes volume, boosts skin elasticity to fill out creases, and smooths fine lines and other imperfections. Because it lasts a long time but is not permanent, Restylane allows you to stay in control of your looks as you age. Restylane is considered the benchmark for clinical excellence in its field. Its safety and efficacy have been clinically proven and are supported by 20 years of robust clinical data, making Restylane® one of the most tried and tested dermal fillers available today. The company continues to invest in research and development in the interests of further improving patient safety and results. Hyaluronic acid is a tissue-friendly substance very similar to the hyaluronic acid that occurs naturally in your body. Treatments replenish your own supply of hyaluronic acid, revitalizing and plumping up your skin to instantly diminish the appearance of creases and lines. The gel is injected into your skin in tiny amounts using a very fine needle. There, it provides hydration and structure, adding natural volume that smooths your overall facial appearance, enhances your facial shape, and/or creates fuller, younger-looking lips. Because Restylane does not contain any “foreign” animal-derived ingredients, there is no need for a skin test to check for possible allergic reaction prior to treatment. The procedure typically takes less than 30 minutes, and most patients see results right away. 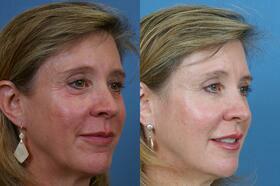 Restylane does not affect underlying muscles or nerves, so it has no effect on facial expressiveness. Restylane offers a subtle, natural approach to enhancing your appearance. Treatments can be used to smooth facial folds and lines, create fuller lips, and shape facial contours, especially the cheeks and chin. One of the reasons Restylane is so popular is that the effects are long lasting but not permanent. That means you are always in control of your looks. Exactly how long each injection lasts depend on a variety of individual factors including your skin type, lifestyle, age, and the specific results you desire. It also depends on your practitioner’s injection technique and skill, so you can be confident you’re getting the best treatment possible when you choose Raval Facial Aesthetics. Although the needle used for these injections is very fine, some people may experience mild discomfort, so Dr. Raval may use a local anesthetic cream. For lip enhancement, another form of anesthesia called a dental bloc (similar to novocaine) is used to numb the area. If you have recently had some kind of cosmetic treatment, we recommend you wait until the area has completely healed and your skin is back to its normal condition. This usually takes 4 to 6 weeks. Is there any downtime with Restylane? Immediately following your treatment, you can expect some slight redness, swelling, pain, tenderness, itching and/or bruising – just as you might expect with any type of injection. However, the discomfort is temporary and generally disappears after a few days. With lip enhancement, it is wise to choose your treatment time with care since your lips may become swollen and appear slightly uneven for a few days. Since this dermal filler was introduced in 1996, it has been used in more than 6 million treatments worldwide. There are a few common injection-site reactions that might occur after a Restylane treatment, but they usually go away within a day or two. These reactions include redness, swelling, pain, itching, bruising, or tenderness at the injection site. Rarely, inflammation may last for up to two weeks. After a lip enhancement, your lips may be swollen for several days. Most people can benefit from Restylane treatment, but it has not been tested on pregnant or breastfeeding women. Restylane should not be used in or near areas where you have or have had inflammation, active skin disease, or related conditions. It should not be injected into an area where you have a permanent implant. During your pre-treatment consultation, you should thoroughly discuss your medical history with Dr. Raval or your aesthetician.